I am beyond excited to introduce a new contributor to Mama Manifesto. I met Meleesa the day I walked into her beauty salon in Huntington Beach to get my hair cut. I quickly learned that Meleesa is far more than a hair stylist and is more like a hair advocate (and just generally an amazingly beautiful and generous person). She is really good at what she does, and takes the time to interview each client about their hair before she begins to style it. In our interview time we quickly connected and saw that we had an opportunity to partner. Here is where I have to explain something - I am the most challenged gal I know when it comes to hair and make up. For reals. I have never in my life really been able to blow dry my own hair well. I feel like my arms get tangled up and I just simply do not know what I am doing. So, what do I do? Well, I kind of don't do anything. I tend to wear my hair in a lot of ponytails. I tend to be frustrated by it all the time. My hair feels like it has a mind of its own - it's not quite sure if it is curly or straight and the frizz factor makes me crazy. Good hair days for me are few and far between and I never know how to communicate what I want in a hair style to a stylist. One of the things I have learned in the past few years of having a blog is that if I am feeling something, it is pretty safe to assume that there are many other women out there who feel the same way. This was our "aha" moment! After Meleesa spent time talking through my questions and teaching me how to do my hair, I told Meleesa that I wished I could help other women out there get their beauty and hair questions answered. I don't think you should only get to have good hair days when you can afford to get blow outs once a week, or when you are one of those gals who just knows how to do her own hair. (You are the ones who make it look so easy!) I think that we should all be able to ask questions and learn how to deal with the pet peeves that drive us crazy. The Lord knows I have a list a mile long. So, here is the deal, mamas - Meleesa is now YOUR hair and beauty advocate! You can ask away with your questions. Have a favorite style you found on pinterest that you don't know how to implement? Ask Meleesa! Have a question about color? Ask Meleesa! Want to know what cut would suit your face? Ask Meleesa! No question is too silly to ask because if she doesn't know the answer, she can lean into her amazing community of stylists to try and find it. We are going to be tackling questions on a weekly basis (hair, makeup, beauty product, etc. ), and we are also going to share a tutorial video once a month that will hopefully give a truly visual education. Meleesa also pursues healthier, greener beauty products so she will be sharing her recommendations here as well. 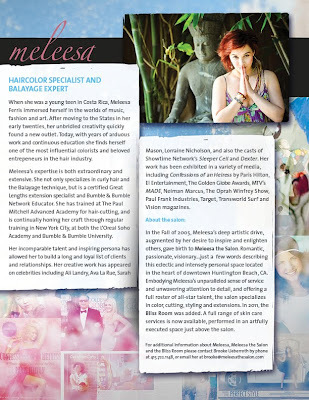 Please do share your questions here in the comments, or send your questions via email to askmeleesa@meleesathesalon.com. This obviously goes without saying, but, if you live in the Southern California area and you do not absolutely LOVE your hair stylist, you have got to give this gal a call. Her salon feels like an anthropologie styled living room and you will feel so cared for by her incredible staff. She has a spa upstairs too. Her beauty salon is located in down town Huntington Beach, and you will love her! We (and by "we", I totally mean her, so don't worry!) are looking forward to tackling those questions so start thinking and asking. Tune in on Thursday for our first video tutorial!